Not quite long Binance listed FET on the exchange, to celebrate these, they have made a partnership together with the Fetch.AI Team, and have committed a total of 400,000 FET in prizes to give away to our users worldwide! 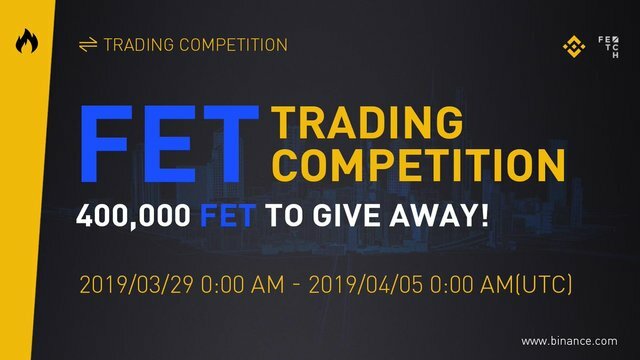 The users ranked 11th, 21th, 31th, 41th, and so forth until 991th place of the top 1,000 FET traders based on the trading volume (including buys and sells) during the ongoing of the competition will split a total of 100,000 FET. The prize is going to be shared two weeks after the competition, and you can always check for your prize by the distribution link on binance.